Those of us who want to do everything we can “to make the dream real” when it comes to the use of space-based resources for the betterment of humanity cannot ignore space solar power (SSP). Decades ago, Gerard O’Neill did a magnificent job of conveying a new vision where humans settle space in an economically sustainable way, beaming energy to Earth to pay for the imports they still need from our planet even after they begin to exploit materials from beyond. In his vision, space would not be just a billion dollar welfare program, or an irrelevant playground for millionaires. It would be a growing economy, like a growing nation, with economic force and momentum and value to Earth in the energy sector where our needs are very serious. He did not oppose conventional government programs in space, or space tourism, but called on us to rise beyond what those alone can accomplish. A major milestone in SSP has been achieved by a recent book by John Mankins, which translates that general vision into a concrete reality with a viable business case. The author was the leader of virtually all the successful work on SSP at NASA over the last decade. His book is a unique source of information on everything NASA knew and had access to, not only in SSP, but in other areas crucial to the future of space. In the first round of George W. Bush’s “Return to the Moon” program, Mankins led efforts in human and robotic technology across the board. Mankins’ book shares what has been really going on in those areas. Most importantly, the book offers a whole new basis for solid, realistic hope that we might succeed after all in the kind of vision inspired by O’Neill. Finally, the book goes deep into concrete business plan options. A year ago, when NSS asked me to take over the duties of Executive Vice President (EVP) for policy, I didn’t think of the job as a chance to dance in the cameras as a cheerleader for powerful forces of nature pushing us ahead to the inevitable promised land. It’s pleasant to think that the human settlement of space is inevitable—and even if it is, on some level, it doesn’t help to take it for granted. I don’t take it for granted. Some good things are happening here and there, as they have for more than 50 years, but there are major obstacles and challenges we need to face up to. I still think of the sad expression in the eyes of a top NASA engineer at the Kennedy Space Center, walking through monuments to past glory, saying “No, we’re not just withering away to nothing, the way people think. Not really. Mars can save us. We hope.” Mankins is offering us a better, more realistic hope, with lots of room for further growth. When I took the EVP job, it reminded me a lot of the Star Trek movie from 2009, when Kirk comes up with a plan to save the Earth. Spock responds: “Captain, the probability of success is only 5 percent, and if it fails, all humans die.” Kirk replies: “If you have a better plan, please tell me right now. If not, let’s just do all we can to make this one work.” His strategy: to maximize whatever probability we have to achieve the goal. But right now, the chances of ultimate success look a lot better than they did just a year ago. Mankins’ book (and the NASA Advanced Innovative Concept report it expands on) is one of the key reasons for hope. Back in the 1970s when there was a lot of hope for SSP, but the designs were unproven and questionable, many energy experts walked away and never looked back. In the 1990s, Mankins led the Fresh Look work, which exposed what was wrong with the old designs, and found new designs that could and would work, but were too expensive. When Mankins and I worked together in the last open U.S. funding competition for SSP, the most serious life-cycle cost estimates for the best available designs were about 20 cents per kwh for the electricity. That was still more expensive than our average costs for electricity generation today (about 10 cents), and it required improvements in launch technology that were not on the horizon. 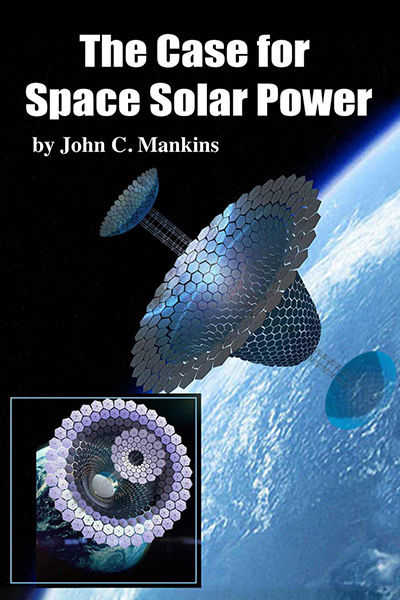 But now, in this book, Mankins presents a new design concept, SPS-ALPHA, for which the best guess on cost is only nine cents per kwh. This year there is also new hope for launch costs, which is a necessary complement to better design and more realistic costs. Mankins is not providing us with a complete blueprint we can go out and deploy tomorrow—but he is offering us a very detailed and serious game plan, with all of the details and leads known to NASA needed to make it work. Many times in Washington, I have seen policymakers and lobbyists get very excited by some kind of new technology, put in lots of money—and end up with a disaster because they didn’t have a workable game plan for the technology at the start. That has happened again and again in the area of space launch, where unrealistic hopes go into orbit with a lot less effort than real spacecraft. Mankins’ game plan is essential to getting it right this time, and getting us to the watershed of affordable electricity actually coming down to the Earth. Reality is more complicated than fantasy, but we need to come to terms with reality to get anywhere real. 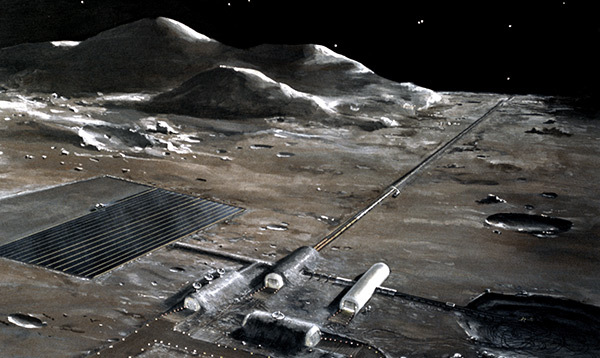 NASA concept of a lunar base with mass driver. The problem is that you can’t do all that for just $50 billion. To do it at all requires lots of infrastructure and enabling technology. If we settle for nothing less than a full Moon base (or a Mars base) first, we may end up with nothing but our dreams. We won’t be able to afford the reality. The Mankins plan is a vital opportunity to build the infrastructure we need in space before we can have a realistic chance to expand the human settlement further. If we fulfill that plan, there will be ever more opportunity and need to bring more and more humans along, step by step, perhaps starting out with a kind of swarm city more like a giant expansion of ISS than like the habitats we will eventually build. The great beauty of SPS-ALPHA is that it relies on a “Lego” kind of approach, building up a huge structure from modules that all weigh less than a ton. This gets rid of the need for heavy-lift vehicles; we can afford to use whatever gets us to space most cheaply, even if it looks more like a Department of Defense vehicle with wings and lift than a NASA rocket with thrust greater than the weight of the vehicle. It also lets us do a lot of the critical research, development, and demonstration right here on Earth. We can explore designs and prove the key concepts right on the ground, even in the laboratories of independent universities and small businesses—perhaps all over the world. Mankins’ book is a crucial guide to the kind of work which can be done today to take us closer to making the dream real. Of course, the book does not tell us everything we need to know to make the dream a reality. The book tells us a huge amount about competing designs for SSP, some of which might work out better after ALPHA paves the way. But there are other possibilities in the same design space, such as new ideas from the Naval Research Labs about how to handle heat flow issues within the ALPHA approach. In the launch area, as with SSP, there are exciting long-term visionary possibilities, but also a near-term game plan crucial to opening up advanced possibilities in the future. (This game plan emerged in part from work for the Air Force, and from research on more advanced options funded by the National Science Foundation.) There is new work on winged reusable launch vehicles, including the new DARPA program XS-1 and new work not widely publicized in Sichuan province in China. But a lot of new work is needed, beyond the scope of this book. Nevertheless, Mankins’ book is the game plan for bringing SSP itself to reality. To make a positive difference in the game, we need to have that plan close at hand, not just on our shelves but in our strategic thinking for all of the things we can do to help. Paul Werbos is the Executive Vice President of the National Space Society. The views herein are the official views of NSS, with no relation implied to any official views of the National Science Foundation, for whom the author works.